How Do Organizations Rank on the Road to the Paper-Free Workplace? 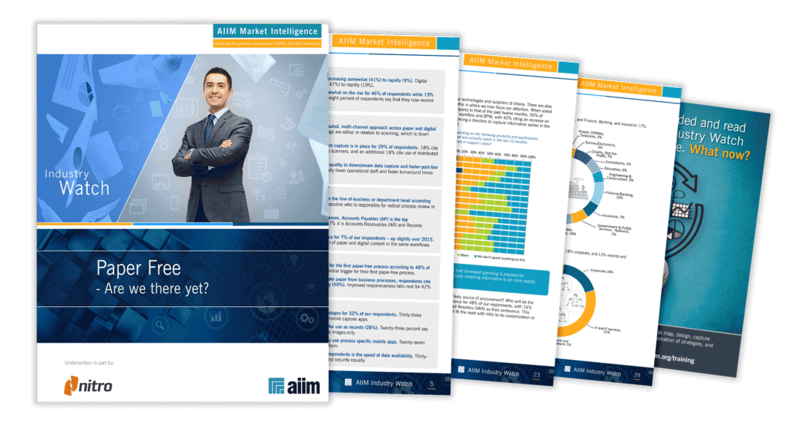 This comprehensive report, based on annual research by AIIM, examines the presence and usage of paper and electronic documents in the workplace, the reasons paper is still commonplace, and the challenges organizations face in their efforts to remove it from document workflows. Download this report for a look into the perceived benefits and potential ROI driving organizations to make progress in the implementation of paper-free processes. The largest challenges facing organizations implementing paper-free processes. Average timelines for achieving ROI. Recommendations for putting effective paperless initiatives in place.